Johannesburg’s Carlton Center with its towering 50-floor height has been Africa’s tallest building for a while now but Kenya is looking to give SA a run for their money with a building project that is in the works. The China State Construction Engineering Company is getting set to start building a 70-story, 300-meter (984 feet) twin tower in Kenya. The building which is to be known as The Pinnacle is meant to be a five-star hotel with leisure facilities, residential and office spaces as well as a shopping mall. The Pinnacle is meant to be underway by early July but the building which will cost 20 billion shillings ($200 million) to complete and may take three years to take its place as Africa’s tallest building. This building is just further proof of the property boom that is sweeping Kenya. Although the country is riddled with corruption, it enjoys a growing economy that features a rising middle class willing to invest in real estate. In fact, coffee plantations are being uprooted to pave the way for gated housing estates and shopping centres. Both regional and international investors are pouring capital into Kenya aimed at developing high-end retail and office spaces. Nairobi is, of course, the major focus of this Kenyan facelift. As the preferred regional global corporates and UN agencies including IBM, Microsoft, Google, and the United Nations Environmental Program, it sees most of the development action. 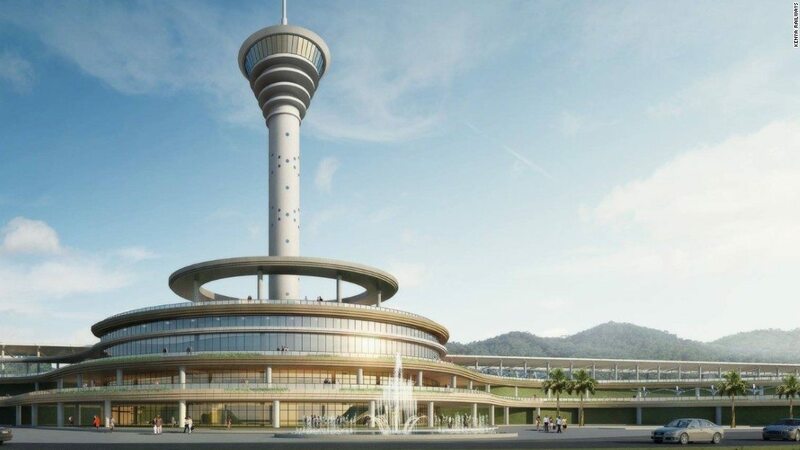 One of sub-Saharan Africa’s biggest shopping centres, the Two Rivers Mall, is situated in Nairobi and there are a number of buildings under construction that will surely be among any listing of Africa’s tallest buildings. Buildings are not the only focus, early this month, President Uhuru Kenyatta launched a $3.2 billion rail line that connected Nairobi to the port city of Mombasa. A new $93 million terminal is also being done at Kenya’s international airport. Then there are the roads and highways being constructed and subsequently raising property prices. In fact, according to real estate company Hass Consult, and prices increased between 1.3% and 3.4% in suburbs and towns neighbouring Nairobi in the first quarter of 2017. As elections draw ever closer, the Government of Kenya continues to point to the opening of these massive malls, hotels, and buildings as a sign of investor confidence. The President says that these projects will create job opportunities for Kenyans and help boost tourism following a period of depression. Africa has its own share of very tall buildings. And some of these buildings stand out like the Carlton Centre in Johannesburg, South Africa which is a 223-metre tall building, the 60-storey Hassan II Mosque is located in Casablanca, Morocco, the Bahia Center in Oran, Algeria which is a 31-storey building that houses a 500-room exclusive hotel with top-class facilities and shopping mall and not forgetting to mention Nigeria’s tallest building, the headquarter building of the Nigerian Telecommunication Company (NITEL) Tower which sits in Lagos Nigeria and is 160 meters tall. This is just to mention just a few of these tall buildings that are littered all across this great and beautiful continent of Africa. The African city with the highest number of tall buildings or skyscrapers is Johannesburg, South Africa’s biggest city. Even Lagos, Nigeria, the largest city in Africa does not boast of the number of tall buildings that Johannesburg (or Jo’burg, as the city is fondly called), can boast of. However, when looking at buildings that are at least 328 feet (100 metres) tall, Jo’burg seems to shy away from the contest as Cairo, Egypt has an outstanding total of 30 tall buildings. Jo’burg has just 14 tall buildings of that height (100 metres) and above but most f them are skyscrapers. Lagos has just less than half of the Jo’burg’s total number (six). The Tanzanian city of Dar Es Salaam has eight. Kenya’s capital city of Nairobi follows with seven. Ivory Coast’s capital city, Abidjan is tied with Lagos at six. But, cumulatively, South Africa still tops the charts in terms of building that are 100 metres tall with its cities Jo’burg, Cape Town, Durban, Pretoria and Bloemfontein combing to give the country a figure of 40 tall buildings that are above 100 metres. Egypt still follows with thirty-three tall buildings, with City Alexandria contributing the other two of Africa’s tallest building.